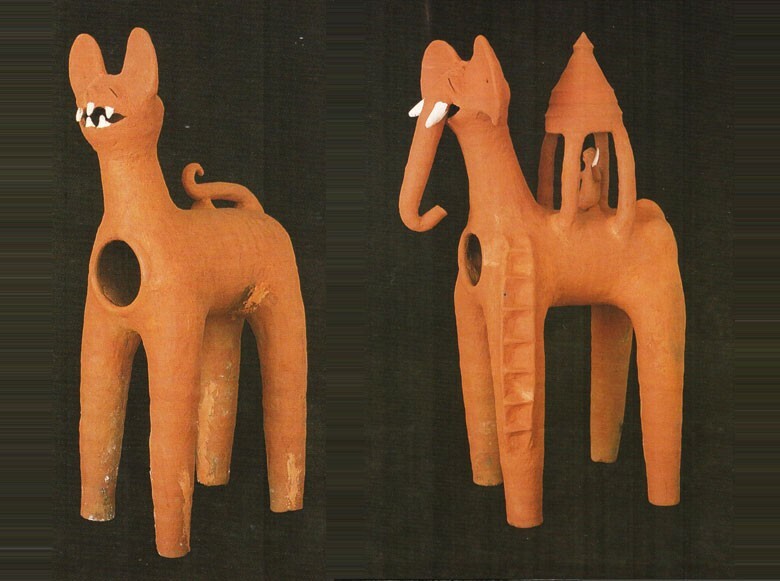 Votive animal figures. Red ochre washed terracotta; 68 cm x 44 cm; 70 cm x 46 cm; 69 cm x 32 cm. Jhabua, Madhya Pradesh. Contemporary VC. The Jhabua district in Madhya Pradesh borders Chhota Udaipur in Gujarat. In both these areas the tribal population of the Bhils, Bhilalas, Rathvas, Nayaks and Dhanuks, have a tradition of offering votive animal figures,1 along with a dhabu to the various deities residing in shrines located on the frontiers of fields and divisions between plots. Every year, during the Dusshera festival the entire village gets together and commissions a huge horse, along with a dhabu for the oil lamp, which are offered together with bowls of grain at the main daivasthana or village shrine for the general well-being and prosperity of the village. The characteristic modelling technique employed by both the Chhota Udaipur and Jhabua kumhars or potters, is such that the main body is wheel-turned, very much like an elongated jar, as are the tube like limbs and the curiously shaped head, while the rest of the embellishments are hand-modelled. The not-so-subtle gaping hole in the frontal side of the animal’s body, a natural anomaly and consequence of the wheel, is an indication of the creative license exercised by the potters of this region. Vessels. Hand-modelled terracotta; max. 40 cm x 32 cm. ; min. 19 cm x 18 cm. Thongjao, Manipur. Contemporary. VC. Goddess Panthoibi1 wife of Anadi Bhagwan, as she is known in Thongjao and Chairan, or Leima Leinaitabi in the Shangmai and Andro villages of Manipur, is said to have taught the Women of Manipur the sacred art of hand-modelled pottery. The women potters model the pots in the ‘slab’ technique where a band of clay is rolled to form a cylinder to which a base is attached. 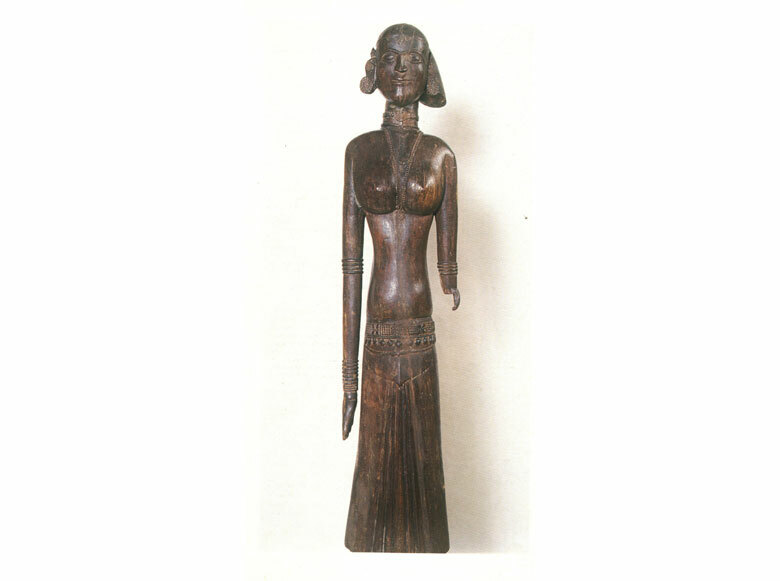 The collar is formed by circumambulating a wooden stool or lepshum in the manner of a wheel. The rest of the pot is beaten into shape with the aid of a wooden beater and a stone anvil. When asked why they prefer not to use the wheel to model their pots, the women generally reply that the wheel makes them dizzy! So important is goddess Panthoibi for the woman potter of Manipur that before every firing, offerings of flowers, incense and water are made to her along with a solemn prayer to protect her pots from cracking. as I walk with you. The philosophy of the people of Manipur is amply illustrated in the metaphoric ballad that refers to how a bird, even if it returns to its own tree, will never recognise the branch it had perched upon earlier. Similarly, pottery shards will always remain separate and different from mother earth, from which they have originated even when they return to it. The essential contradictions of life and death are inherent in the songs of the potter women of Manipur. 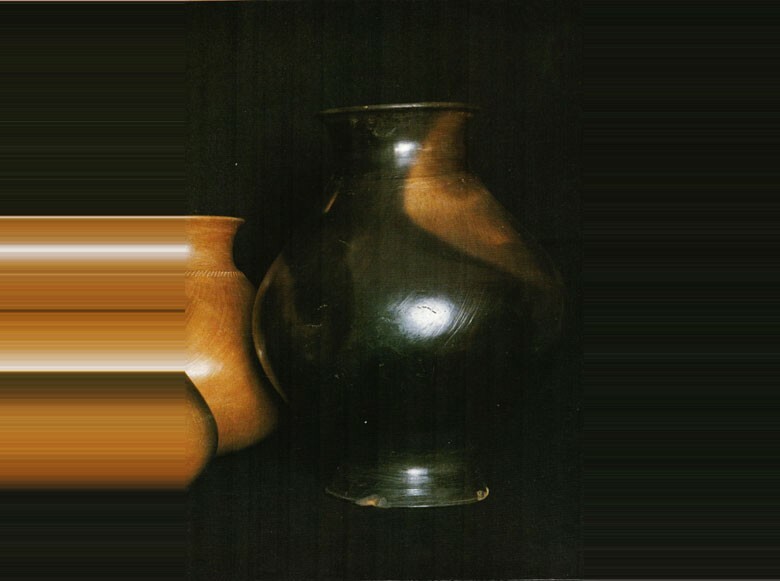 The unusual shapes of these vessels, so elegantly modelled, could never have been turned on a wheel. The orange-black tongues of fire on the glossy surface of these pots are profound symbols of nature’s contribution to aesthetic sensitivity. Shrine of neo-Vaishnava deity, Dev Narayan. Painted and varnished terracotta plaque in hollow relief; 75 cm x 55 cm. Molela, Rajasthan. Contemporary. VCD. Once upon a time1 a blind potter in village Molela, Rajasthan, dreamt of the local deity Dev Narayan, also known as Dharamraj, who instructed him to construct his image as a horse rider in clay. The next morning the potter’s vision was restored and he found a hand impression on a brick in his courtyard left by the lord himself. Having been promised his livelihood by the deity, the potter was to continue making these idols or murtis for the rest of the village. One day he came home drunk and did not find the money that used to appear by the brick. All his descendants, therefore, continue to make terracotta plaques of Dev Narayan which, made only in Molela, are bought by people coming from as far away as Gujarat. The long snake, found in all such plaques of Dev Narayan, is symbolic of the deity, who is an incarnation of Lord Vishnu. The cowherd on his right is Nepha Gwala and the man on his bottom left, Chhocha Bhat or one who keeps records of his clan history. Dev Narayan is shown riding his mare Bavli, and, as is characteristic of all Rajput warriors, he holds a bhala or javelin and dhal or shield. He is said to have taker birth from a lotus flower. His mother, Sadhu mata, was the only woman left in the kingdom devastated by war since the other women had committed sati after the death of their husbands. Mother and child. Terracotta; 18 cm x 12 cm. Madhubani, Bihar. Contemporary. 88/3/D. On the day of the new moon, in the Hindu month of Kartik (October-November), young girls and women of Madhubani prepare delightful unbaked clay figures of the goddess Shyama1, believed to be the daughter of Krishna, and her husband Chakaiva2, satbhaiyan, or “seven brothers”, malin or “flower-girl”, jhanji kutta, a dog and dholia or drummer, for the benefit of their brothers’ well-being in whose honour the 10 day long festival Chhathi is celebrated. On the full moon day the brothers in the family ritually send Shyama back to her in-laws’ home by causing the symbolic disintegration of her image. The clay figures carried in baskets, are ultimately “returned to earth” in the fields. 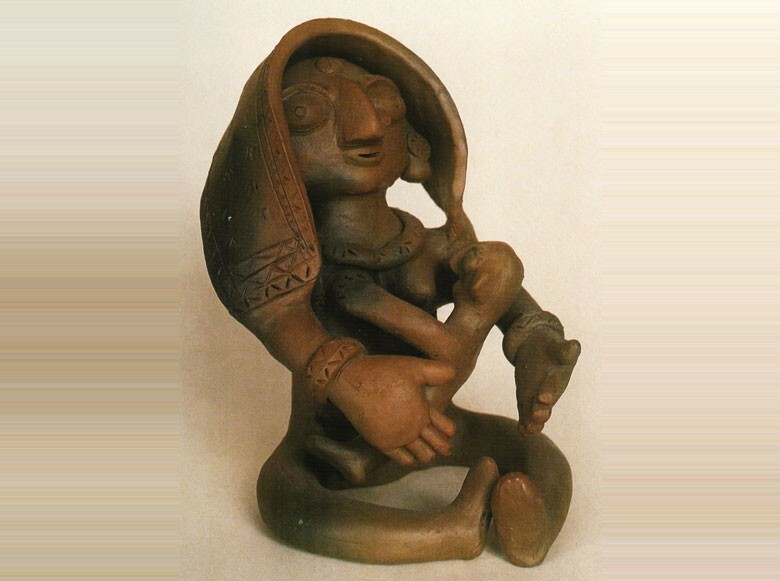 This terracotta mother with her child is an offshoot of this tradition which subsequently developed its own vocabulary of forms and symbols. The head cloth, worn by rural women all over India, gracefully falling across the shoulders, the somewhat unabashed yet virtuous position of the legs and the possessive arm around the child epitomise the instincts of maternal love so well known to Nirmala Devi, the creator-craftswoman of this folk terracotta. 2. A majority of women in Mithila report that Chakaiva is Shyama’s brother but Ganga Devi’s version seems more plausible. Jar. “Black pottery” with designs in silver; 31 cm x 25 cm. Azamgarh, Uttar Pradesh. Contemporary. MC/460. 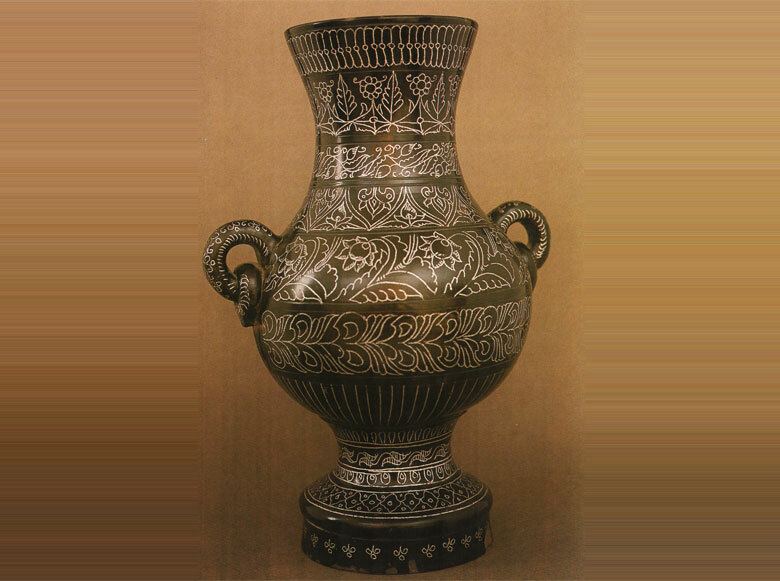 Nizamabad, in Azamgarh, is known for its “black” pottery where double glazing and double firing in a totally sealed container lends the pottery a wonderful lustrous black color. The beauty of the technique, however, lies in the engraving, or nakkashi, usually in floral patterns, which is executed on the semi-dry pot with a fine bamboo twig. After firing, a powdered mixture of lead, mercury and tin or bukani is filled in by hand onto the etched grooves of the design, washed with water, and finally burnished to highlight the starry sparkle of the design against the black ground of the terracotta. 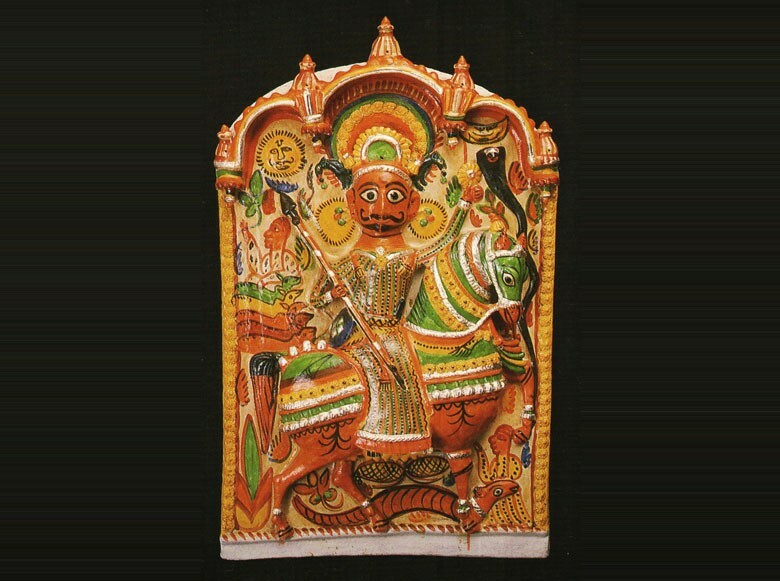 Gouramma, female bhuta deity. Carved jackwood, originally polychromed, 115 cm x 43 cm. 170 cm x 30 cm. Mekkekattu, Udipi, South Karnataka. c. late 18th century. 7/3963. Among the many female bhuta deities from the shrine of Mekkekattu, Gouramma stands out as an extremely beautiful image in terms of sculptural quality. Probably the spirit of a once socially prominent woman, the deity is rendered with an amiable countenance, elaborate coiffure, grand ornaments and costume. She is, in most likelihood, an attendant to Lord Nandikeshvara, the bull deity and principal object of worship at the Nandikeshvara daivasthana or shrine in Mekkekattu. The larger than life size-wood sculptures representing the various bhutas in their corporeal existence are an integral part of the bhuta cult. They are generally made from wood obtained from the jack or wild-jackfruit trees. The colours employed are natural pigments obtained from minerals and plants. A coating of lac is applied for the finishing touches. Significantly, only the eyes are left untouched for the final ritual of prana-pratishtha or “breathing-in of life”, when the deity is said to descend into the sculpture and occupy it. The idol is covered with a sari, or a piece of cloth, and only after a ritual offering is performed is the painter able to go under the cloth, fill in the eyes, and receive his compensation. During the invocation of the bhuta spirit, the possession rituals involve a bhuta impersonator or patri who acts as a vehicle of the particular bhuta deity he is personifying. It is interesting to note that the spirit of the bhuta “enters into” the physical body of the human representation at this stage and not into its sculptural form. A contemporary regional Indian restaurant located in the National Crafts Museum in New Delhi. By subscribing to our mailing list you will receive updates on What’s On at the Crafts Museum. Copyright 2016 Crafts Museum. All Right Reserved.